Post-editing is the process of correcting machine translation output so that it meets human quality criteria. 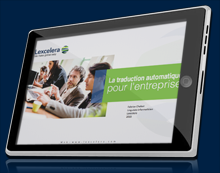 As an early adopter of machine translation, Lexcelera has extensive experience in post-editing machine translations and boasts one of the industry’s largest networks of trained post-editors. Lexcelera offers post-editing in a wide range of languages such as French, Spanish, Chinese, Japanese, German, Italian, Dutch, Portuguese, Arabic and Russian. Depending on the quality needed, post-editing may be light or full. However, not all MT output requires a post-edit. With proper training and full customization, some MT engines are capable of delivering understandable quality for functional content without any post-editing whatsoever. “Raw” MT output may be appropriate for frequently updated content such as customer support knowledge bases, user-generated content (UGC) and legal eDiscovery. Full post-editing ensures that the document reads like a human translation, and cannot be identified as a machine translation. Post-editors have been shown to pay closer attention when correcting MT-generated text than when correcting TM (translation memory) matches. Light post-editing aims at making information understandable, if not perfectly fluent.